18th to 19th-century enclosure of upland commons on western slopes of the Clwydian hills with roadside cottage encroachments. The area formed part of the upland commons on the eastern edges of the medieval ecclesiastical parishes of both Llangwyfan and Llandyrnog, and fell within the ancient commote of Dogfeilyn in the cantref of Dyffryn Clwyd. Steeply-sloping upper enclosed sides of Clwydians hills, between a height of about 190-410m OD, rising from the limits of the earlier enclosed land up to the western ramparts of the Penycloddiau Iron Age hillfort. The area forms part of the Clwydian Range AONB. The hill-slope is broken by a number of steep-sided stream valleys including the Nant Simon to the north of Llangwyfan and by the valley to the south of Llangwyfan. The 19th-century farms at Fron-dyffryn and Glyn Arthur, at heights of 205m and 260m respectively, are the only settlements falling within the character area. 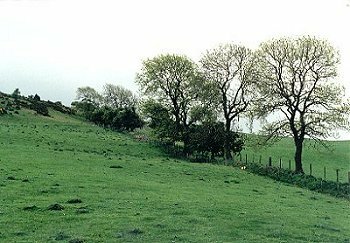 Medium to large-sized rectangular fields enclosing upland rough grazing and some improved pasture, with field boundaries formed of thin and occasionally grown out hawthorn hedges, occasionally represented by intermittent lines of trees and shrubs, being replaced by post and wire fencing. Some field boundaries represented by large banks and lynchets, with traces of remnant field banks in the forestry to the south of Penycloddiau. Similar in general character to the Fron-heulog character area further south. Modern coniferous plantations on the steeper ground just below the ramparts of Penycloddiau and in the steep-sided valley to the east of Llangwyfan, partly felled. The area is bisected by the public road running through the steep-sided valley west between Llangwyfan and Nannerch. The Offa's Dyke path runs along part of the eastern side of the character area. The farmland around Glyn Arthur is set out in the manner of parkland, with large, mature trees along the boundaries including the side of the public road leading up towards Moel Arthur.